On Sunday morning November 17 at 7:25 am I stood on the starting line in Alexandria, Virginia behind the elite runners who were running in The USA Track and Field National 12K Road Racing Championship. 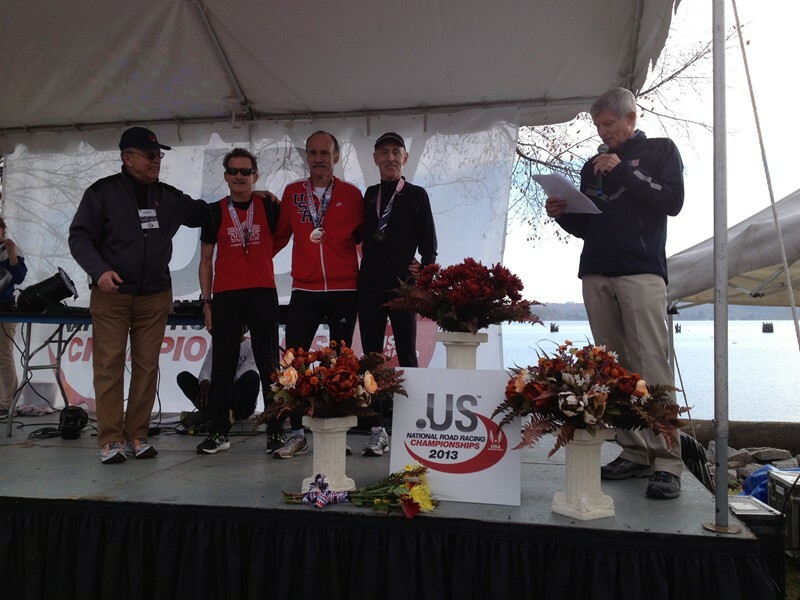 I had no illusions that I could contend for the elite championship, but I was attempting to win the 60+ age division national masters 12K, which was held in conjunction with the elite race. Entering this race was just a spur of the moment decision and I had my doubts if I could handle the distance even at a 6:00 mile pace. The longest race I have competed in the last several years has been an 8K road race. I ran a 12K training run a week prior to this event with Earl Brown just to see how my legs would handle the distance. My legs were very tired after the run and it took me several days to recover. All of these thoughts were going around in my head as I waited for the race to start. Teresa, my wife, had just told me minutes earlier not to worry, just to run my best and she would be waiting for me at the finish. Peter Mullin, from Houston, Texas, who has won numerous national masters titles this year in the 60+ division was the person I was going to have to beat. I intended to run out with Peter and hopefully be with him at the end. My intention was to attempt to beat him in a sprint to the finish. When the gun went off I looked around and Peter was on my right shoulder. 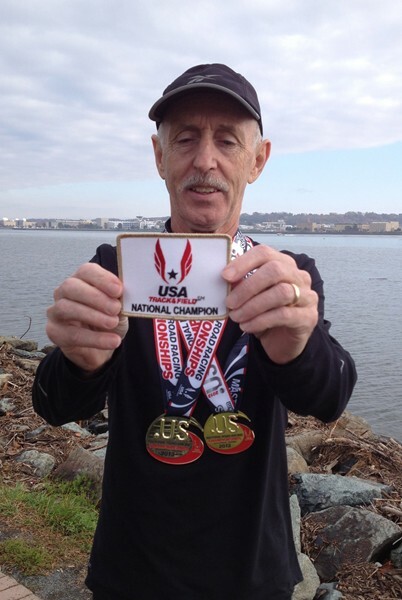 Peter is the USA Track and Field 60+ national masters 5k, 8K, 10K and half marathon champion, and he really knows how to run an even pace. I went through the first mile in 5:53 with Peter 2 seconds behind. At mile and a half all my plans went out the window as I felt that I was running too slowly and needed to pick up the pace. I set my sights on the next runner ahead and slowly started picking off people. My time at the 5K was 17:57 and I was starting to get tired. I went through the 10K split at 36:00 and Peter's time was 37:12. My legs were completely shot and I realized I had to continue to run strong or Peter would pass me. 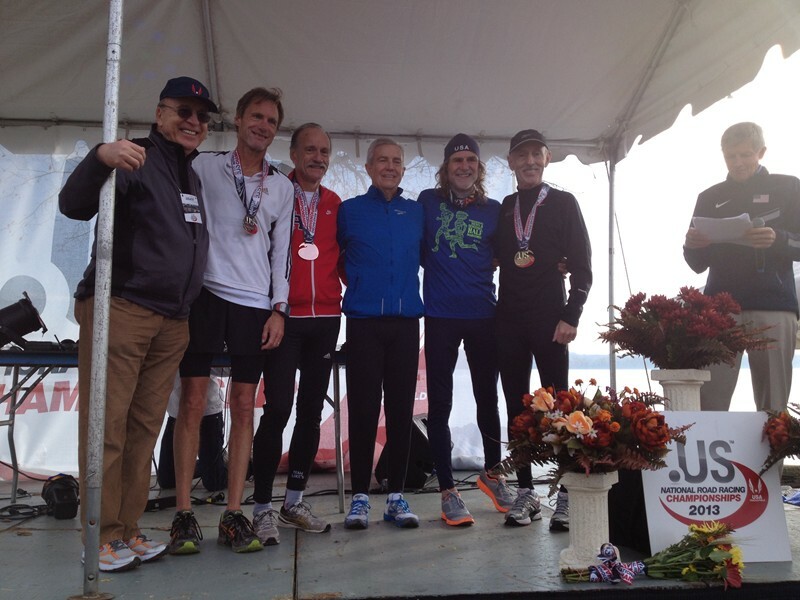 I came through the finish in 43:04 and I asked my wife, Teresa, if I had been beaten by anyone over 60 years old. She told me unofficially that I was first in that age bracket and had won my 2nd National Championship in a month. My finishing time was 43:04, Peter Mullin finished 2nd in 44:28 and Kirk Larsen from Atlanta Track Club was 3rd in 47:31. At the awards ceremony, I found out that I was also the overall age graded champion for the 40 years and older division with an age graded score of 93:79%. My biggest shock was when they announced that I had just set a new American record for the 12K for the 60 and over division. My time of 43:04 had beaten the old record of 43:43, which had been set in February 2000.